What are Pinterest Rich Pins and why should I use them? Pinterest rolled out Rich Pins on their site as a way of providing enhanced information to users. For our stores, the type or rich pin we want is the Product Rich Pin. 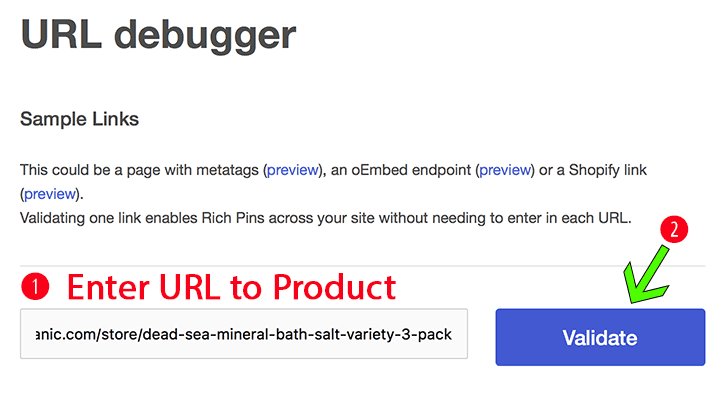 Our templates have the necessary code markup for rich pins, but you have to apply to use them. So what are they? Product Rich Pin have additional information with Pricing and In Stock Availability when you look at the pins detail page. This happens automatically once you have been approved and will apply to every pin shared from your site, either by you or your visitors. Ready to get started? The process for approval is really easy! This is the Rich Pin validator page. Scroll down to the “URL DEBUGGER” section. Enter the URL to the PRODUCT DETAIL PAGE of one of the products on your store. It must be a single detail page, but it doesn’t matter what product you choose. Just pick one, and copy and paste the link. Your template has the necessary markup for Rich Pins, so you should see a success message that you can apply to enable your Rich Pins. The DOMAIN and radio button for HTML TAGS will already be there – just click the “APPLY NOW” message. You will then receive a message like the one below telling you they will review your application and email you. Q. Does might sight need SSL (aka https)? A. No. Rich Pins are available and just require requesting them to be enabled. You will not need your site on SSL to apply. Q. If visitors to my site share my products, with they show as Rich Pins? A. Yes, if you have applied and been approved as per the steps above. Q. If I am using the Pinterest Posting Feature, will these be Rich Pins? A. Please open a support ticket and we’ll help you out.